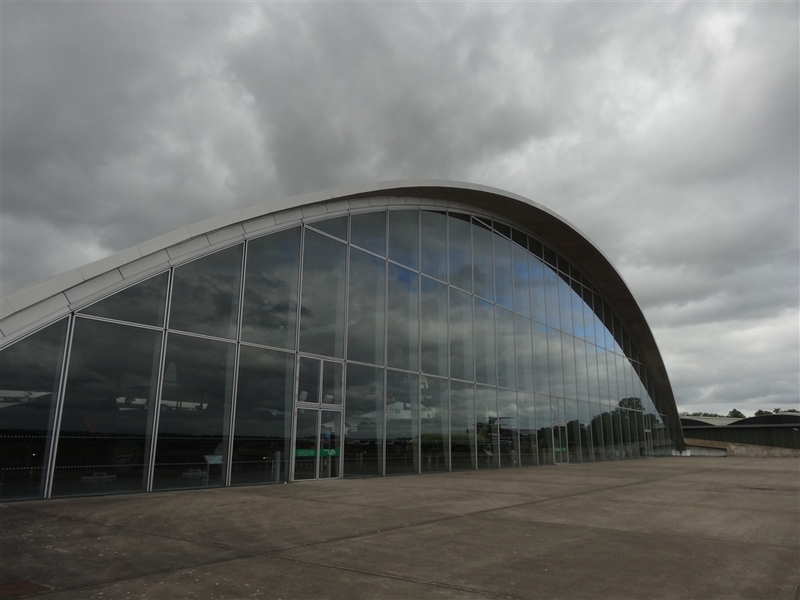 The Idea of a day trip to the Imperial War Museum at Duxford was floating amongst us for a while but there was always some problem. Either one of us had to work at the weekend, or someone was on holiday, or someone else had a hangover. However, a few weeks ago, we finally managed to set a firm date for our Stanfords trip to the IWM. We decided to take a train to Whittlesford Parkway station which is located less than two miles from the museum, and walk from there. Otherwise there is a bus route from Cambridge serving the museums on Sunday. If you drive, Duxford is located just beside junction 10 on the M11. What struck me first was the size of the museum. There is number of hangars, some of them quite enormous, located next to grass and hard runways. It was all bigger and more than I expected. We started our tour from the largest hangar of the complex, the AirSpace. 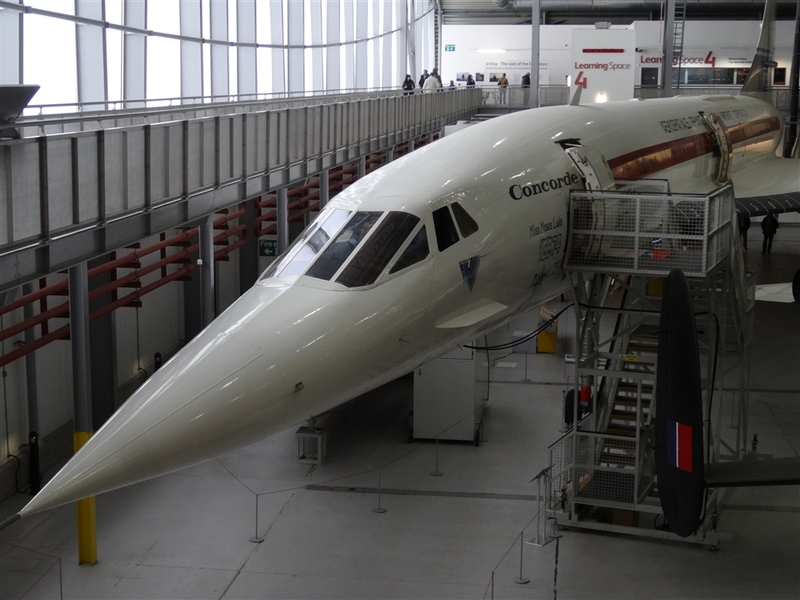 It displays mostly British and Commonwealth-built aircraft and its absolute highlight is of course Concorde. It was one of the first to be built and it was used for the test flights. In fact it has the distinction of having flown the fastest of any Concorde during the flight trials in which it was involved. What’s most amazing is how low-tech everything looks, especially the cockpit, and how tiny the windows are. Still it is a spectacular machine, the only supersonic passenger jet ever. Other great machines in this section include such icons as the Spitfire, Hurricane or Harrier as well as lesser known but impressive beasts like an Avro Vulcan strategic bomber (a huge delta-shaped plane which was used to carry the UK’s atomic warheads), an Avro Lancaster heavy bomber from WWII and a Short Sunderland flying boat (used for hunting U-boats). There are many more smaller or less known aircraft in this huge space, we could probably spend a few hours in this one hangar alone but we decided to move on as there was so much more to see. For our next stop we chose the American Air Museum which has the largest collection of US historic military aircraft in Europe. This collection is displayed in a striking modern building designed by Foster and Partners and opened in 1997. It has a clean design comprising a concrete domed roof and a huge 90 meters wide glass front. While a spectacular building in its own right the displayed aircraft somehow overshadow it completely. The big open exhibition floor (measuring about 6000 sq. meters) is dominated by the B-52D Stratofortress with its 56 meters wingspan and 8 engines. Other classics include planes from the WWII like B-17 Flying Fortress, B-29 Superfortress (similar to the ones which dropped the atomic bombs on Hiroshima and Nagasaki) and B-24 Liberator as well as more recent machines. 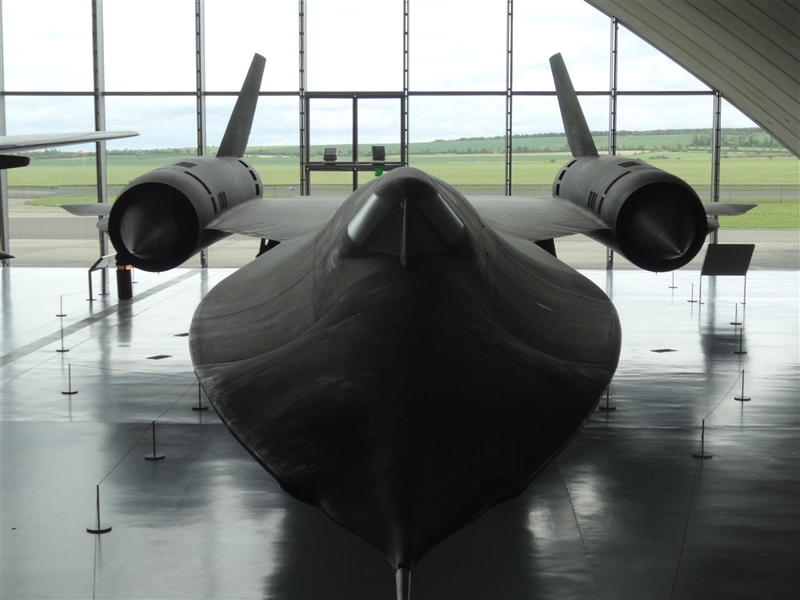 One of them is my absolute favourite in the whole museum, the Lockheed SR-71 Blackbird, the highest flying and fastest manned jet aeroplane ever built. It is black, it looks mean and it could fly over 3500 kph. I was fascinated by this iconic futuristic machine ever since I first read about it a long time ago when I was still in high school. Ironically, I didn’t even know there was one on display in Duxford. Once I saw it my jaw literally dropped. Even if you are not particularly interested in planes it really looks stunning, better than any art installation if you ask me. Just to make my day even better there was another plane which I used to read a lot about, the tank-busting, ground attack, A-10 Thunderbolt II. It is a weird looking but vicious machine armed with one of the most powerful guns ever mounted on a plane. With seven barrels it can shot 35 rounds per second and its bullets are depleted uranium armour-piercing ammunition. 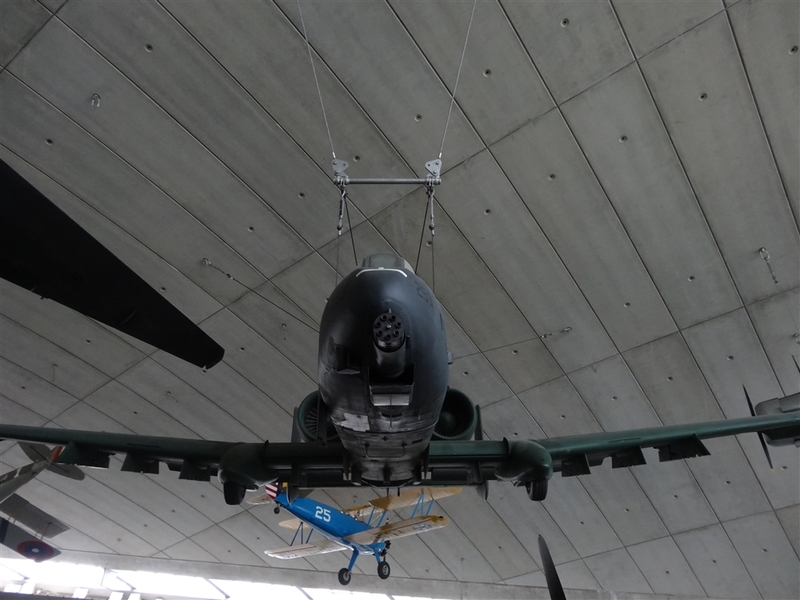 You really wouldn’t like to stay in its way, unless of course in Duxford, taking photos. Oh, and the pilot sits in a “bathtub” of titanium armour. Other aircraft in the AAM you might have heard about is the Lockheed U-2 spy plane, P-51 Mustang or F-4 Phantom. There is also a piece of Saddam’s 350mm “Supergun”. But Duxford is not only about the planes. The Land Warfare section houses an extensive collection of tanks , military vehicles and artillery. Among its highlights I have to list the Russian built T-34 (often described as the most effective, efficient, and influential design of World War II) IS-2 “Joseph Stalin”, a heavy tank used by the Red Army during the Battle of Berlin, and the German built Sd Kfz 173 Jagdpanther (Tank Destroyer), one of the heaviest and best tanks of WWII. Apart from those classics there are also plenty of interesting quirky vehicles such as a command tank used by Bernard Montgomery where the front gun was replaced by a wooden dummy to create more space for the communication equipment, Monty’s bedroom caravan which was captured from an Italian general in Northern Africa or the “map caravan” which was used by Monty during the decisive push by the Allies from June 1944 until May 1945. The list could go on and on but I’ll try to contain myself and stop listing everything. From the Land Warfare building we headed back towards the aircraft part of the museum. There, close to the runway, are located three of the original hangars used during the Battle of Britain. In fact they were built all the way back at the end of WWI. These quite impressive structures, built with brick but with interesting wooden lattice roof girders and huge wooden concertina doors, are in remarkably good condition considering their age. One of them is home to the Battle of Britain exhibition which explains this pivotal moment in Britain’s history as well as considering air defence of the UK during the First World War and Cold War. 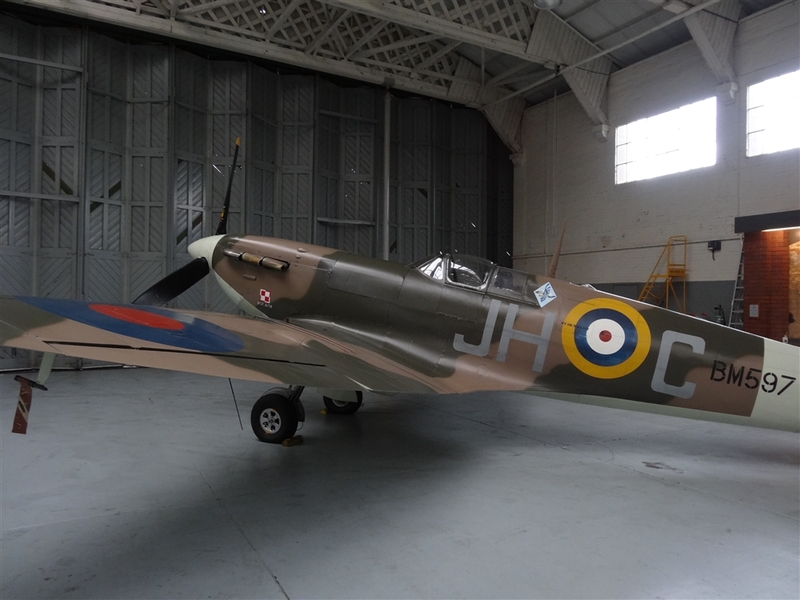 The main exhibits there are the legendary Supermarine Spitfire as well as the bit forgotten, but arguably more important, Hawker Hurricane (accounting for 60% of the RAF’s air victories in the battle). 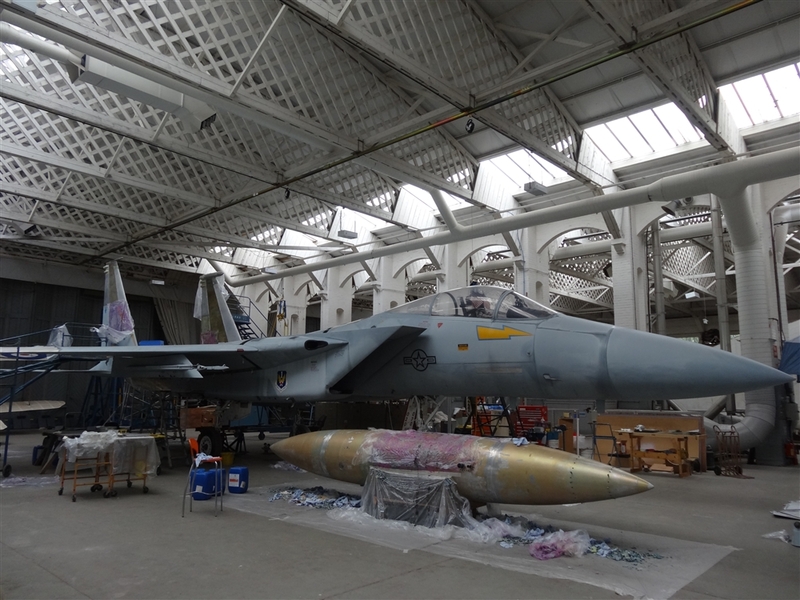 Another of the historic hangars is home to the Conservation in Action, a place where staff and volunteers preserve and restore the varied exhibits, from WWI planes to modern jet fighters, everything happening just in front of the visitors. 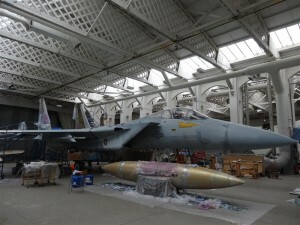 In fact during our visit there was a F-15 Eagle parked inside waiting for a fresh coat of paint. Behind the old hangars is located one more spot that you shouldn’t miss during your visit, the 1940 Operations Room. It has earth mounds built around on all sides, to limit the blast damage, but it actually looks very flimsy. The original fixtures were gone long ago so what you see nowadays is a very accurate reconstruction based on documents, photographs, film and personal recollections. 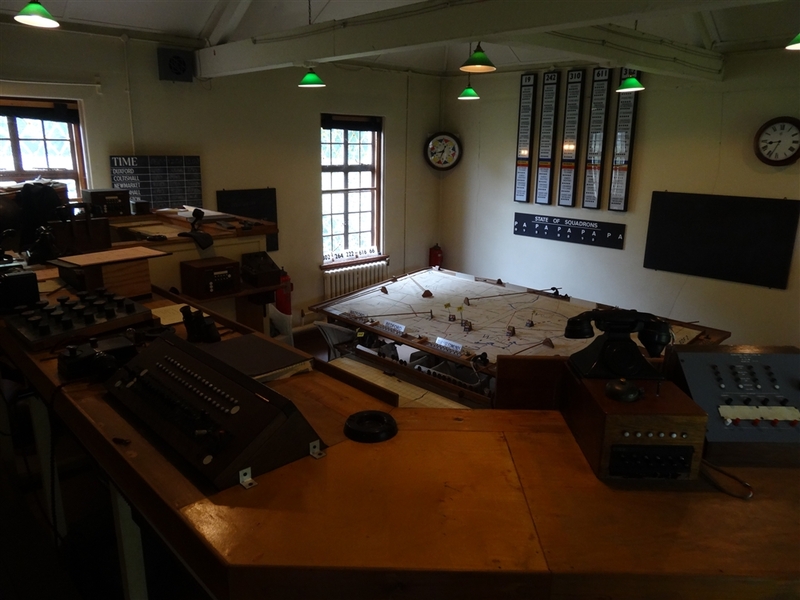 Even if just a reconstruction it still offers a great insight into how the air battles were commanded and fought, with a big map-table, telephone exchange, various radios etc. Again, it all looks so low-tech, especially when compared with modern aviation. When we left the Operations Room we realized that museum was about to close in 15-20 minutes. Somehow we had spent almost 7 hours constantly touring the exhibits. We even completely forgot about lunch (quite a feat for three large lads like us). Suddenly we could feel all the distance we walked during the day, it must have been miles and miles. Including the journey to museum and then back to London it was a long day trip but a very satisfying one. It really helped that one of my colleagues is actually a pilot himself and he really knows the planes. He could tell some interesting story about almost every exhibit. But even if you don’t have an expert like that at hand you will still have loads of fun as long as you are even mildly interested in aviation or the military. I guarantee you. This entry was posted in Uncategorized and tagged A-10 Thunderbolt II, B-17 Flying Fortress, B-29 Superfortress, B-52D Stratofortress, Battle of Britain, Duxford, Imperial War Museum, SR-71 Blackbird, Supermarine Spitfire by Geogregor. Bookmark the permalink.